【Soft Material】: yeabiu large warp scarf for women is made of soft cashmere, lightweight, breathable and comfortable, a warm friend that keeps you warm and cozy in cold weather. 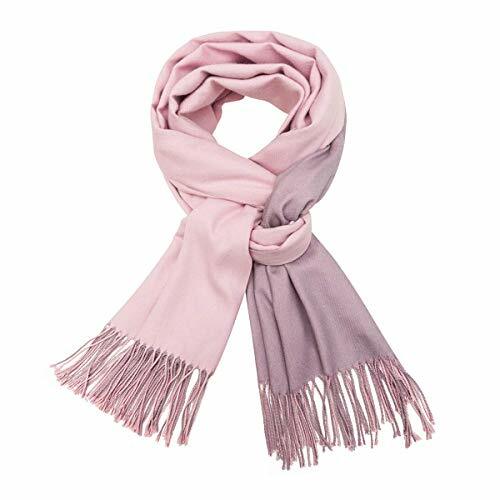 【Stylish Design】: women oversized scarf comes with a design of different colors on both sides and its\' edges is decorated by long tassel, perfect complimenting your outfit for any season and making yours the most special one in ordinary scarves. 【Wide Application】: Great as a shawl scarf, pashmina shawl wrap, party scarf, stole or light scarves for women, moreover it also can be worn as a bridal, bridesmaid\'s pashmina or as a beautiful complement to a guest\' s formal outfit. This soft, comfortable womens blanket scarf will get you through any season, whether in winter, summer, spring or fall, this scarf will cover it all. 【Best Gift for Women & Ladies】: all of women love fashion. yeabiu fringe tassel scarves is designed in versatile beautiful colors that is chic and perfect for many clothes, and is an ideal gift for women on Valentine\'s Day, Thanksgiving Days, Christmas Day\'s,Wedding, Anniversary, even Mother\'s Day ect. 【100% Purchase Warranty】: All our products have 30 days worry-free refunds or returns guarantee if the pashmina scarf is not what you expected. Just enjoy your absolutely RISK FREE purchase.